Photo: Representatives of the Greater Naples Chamber of Commerce and other guests join Hope President and CEO Samira K. Beckwith in the ribbon cutting ceremony at the new Hope Care Center of Naples. Hope HealthCare Services has announced the opening of a special new facility to add to the quality of life of adults in Collier County. According to Hope President and CEO Samira K. Beckwith, the agency saw an increasing need for the care of people who may need assistance during the day but prefer to live at home. Adult Day Health services can be especially helpful for adults with functional impairments requiring a protective environment. Therapeutic social and health activities are integral parts of the program. 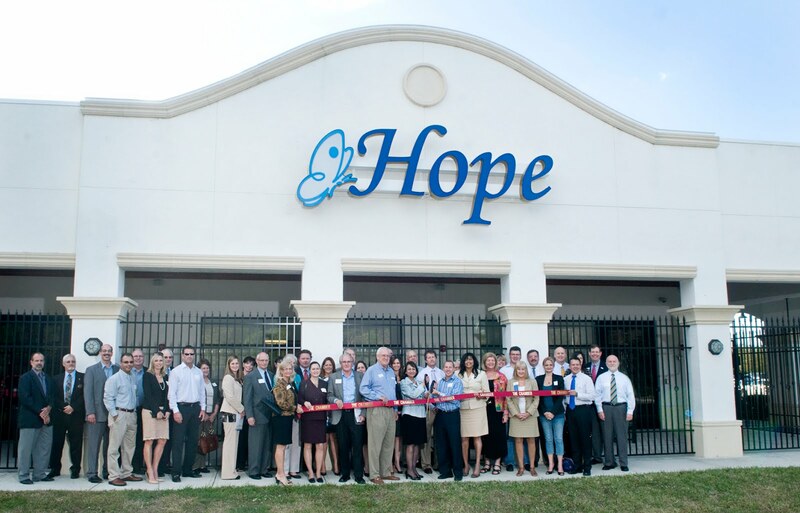 Hope’s Adult Day Health services will be provided at the new Hope Care Center of Naples, a spacious, comfortable state-of-the-art facility located at 13020 Livingston Road. Individual care programs are determined at enrollment, based on each person’s interests, hobbies and career history so that daily activities can be customized. Each client’s day will begin with conversations with Hope staff members and volunteers about the news of the day and other topics of interest, along with a discussion of plans and goals for the day. Light exercise sessions will help the individual to maintain body strength, primarily for balance and fall prevention. The day will also include rest periods, games, gardening, art, music and pet therapy, and even dancing if desired. A nutritious lunch and snacks will be available. Among the unique features of the Hope Care Center of Naples are specially designed therapy areas. For example, an individual who is new to a wheelchair will be able to learn how to easily get in and out of bed, and how to maneuver indoors. A nurse will always be on duty. Family members will have peace of mind knowing their loved one is being well cared for in their absence, in a safe environment. The facility is open from 8 AM to 5 PM Monday through Friday, and participants may attend all day or for only a few hours. Transportation is available. Hope has served the residents of Collier County for more than seven years through Hope Choices, a long-term, at-home program of care provided by Medicaid and the Department of Elder Affairs for people 65 and older, whose goal is to remain in their own home. Adult Day Health is the first phase of services to be provided at the facility. 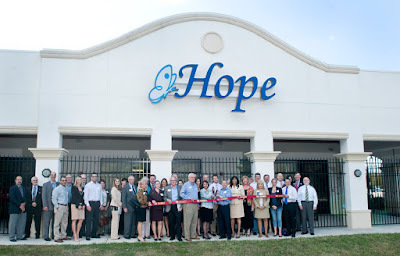 Later in 2012, the Hope Care Center of Naples will also offer Hope PACE, a Program of All-inclusive Care for the Elderly. This Medicare/Medicaid or private pay program will enable people 55 and older to maintain independent living as they enjoy the amenities of the Center in addition to care and supportive services at home. “With our Adult Day Health services, we can now offer even more people the opportunity to have a comfortable, satisfying and dignified life,” Beckwith said. For more information about Hope’s Adult Day Health services, call (toll free) 1-855-454-3100.